Regardless of how it happens, you’ll need to clean the paint from your leather as soon as possible to prevent long-lasting damage or staining. As soon as you notice paint on your car’s leather, take swift action. You can prevent hours of hard work and permanent damage by cleaning wet paint from your leather as soon as it occurs. Step 1: Dab away the wet paint with a clean cloth. Lightly dab at the paint, trying not to press the paint deeper into the leather. Warning: Do not wipe the paint away. The wiping motion will push the paint and its dyes deeper into the surface and spread to other parts of the seat. Pick up as much of the wet paint as you can with the cloth, always using a fresh spot on your clean cloth when you dab. 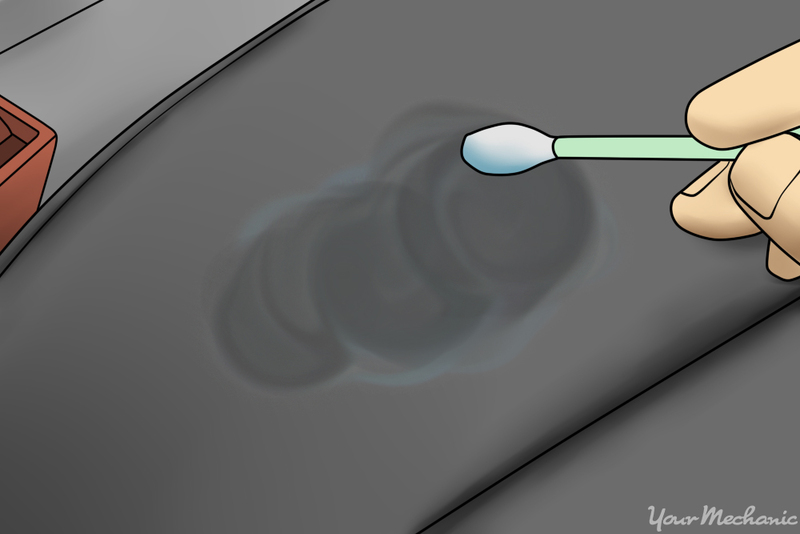 Step 2: Roll a dry cotton swab on the paint spot. The non-abrasive, dry cotton swab will gently pick up more of the paint off the leather seat. 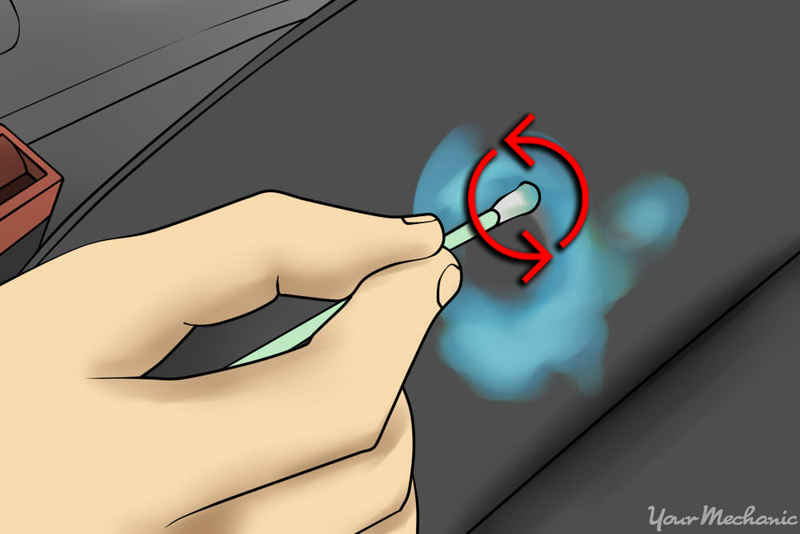 Repeat it with a fresh cotton swab (Q-Tip) as often as you need to until there is no more paint coming off the leather. Step 3: Wipe the paint spot with an olive oil-soaked cotton swab. Dip the end of the cotton swab into olive oil, then very gently rub the fresh paint spot with the wet end of the cotton swab. The olive oil will prevent the paint from drying and will allow it to be absorbed into the swab. Note: Gentle oils like olive oil will not damage the dyes in the leather. Step 4: Remove the olive oil from the paint spot with a cloth. The olive oil and paint will soak into the cloth, removing it away from the leather. Step 5: Repeat the steps as necessary until the leather is completely cleaned of paint. If the paint spot is still present and repeating this process isn’t helping any further, try the next method. Step 6: Wipe off any extra residue. 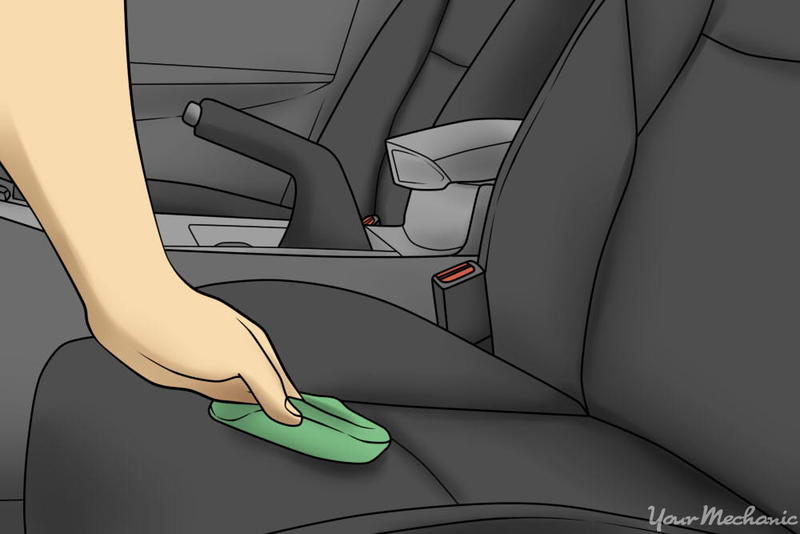 Give the leather seat one last wipe with another clean cloth dampened in warm water to remove any extra oily residue without drying out the leather. Warning: Dried-on paint has a high likelihood of leaving a permanent mark on your leather seat. It’s important to take great care in each step to minimize any damage. Step 1: Lightly scrape loose paint with scraping knife. Very lightly press the blade against the paint when you are scraping, avoiding contact with the leather surface as much as possible to prevent scratches on the leather. Any raised portions of paint can be very carefully scraped from the top, making sure to never cut through the paint and into the leather. Wipe any loose paint away with a clean, dry cloth. Step 2: Soften the paint with olive oil. Olive oil is gentle on leather and an excellent moisturizer. 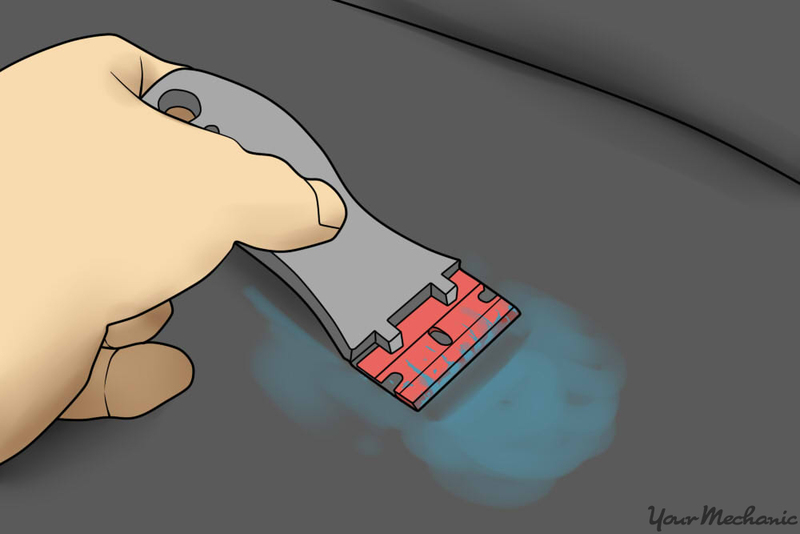 It can assist in softening the paint that is still stuck to the leather seat. Use a cotton swab to apply olive oil directly onto the paint, working it in small circles to loosen the paint. Step 3: Gently scrape softened paint. Gently scrape the softened paint with your scraper, then wipe away with a clean cloth. Step 4: Wipe the seat clean. 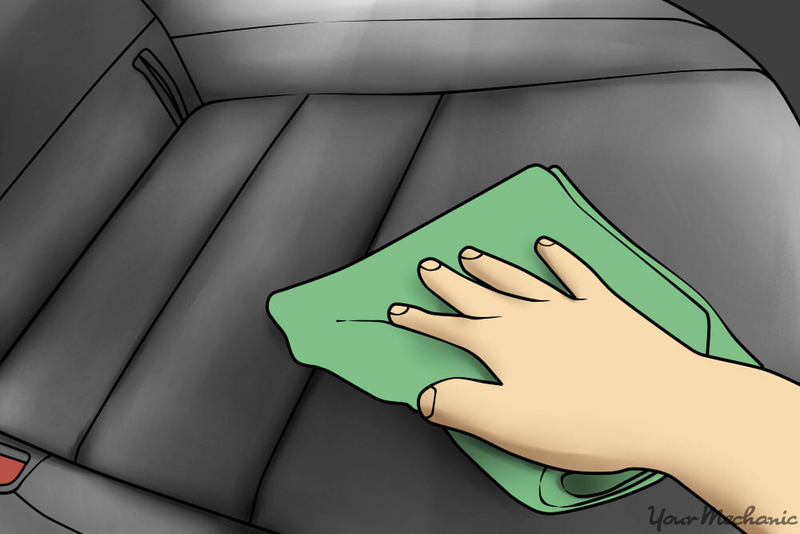 Wipe the seat with a clean cloth dampened with warm water and evaluate your progress. If paint still remains visible, you may need to use a harsher chemical to dissolve the paint. Step 5: Evaluate your options. If the paint is only minimally visible, you may want to stop the removal. If the paint is quite noticeable or you want it completely gone, continue with a harsher chemical. 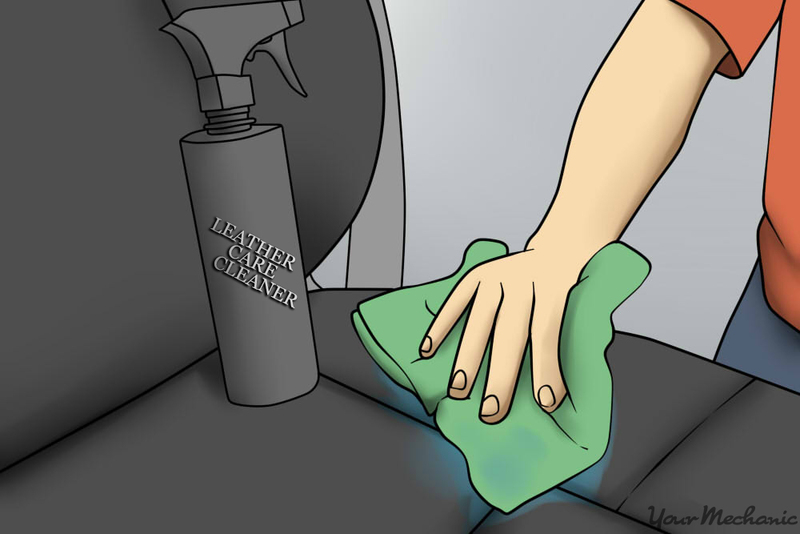 Warning: Using chemicals such as acetone and rubbing alcohol on your car’s leather can cause permanent staining or physical damage to the leather. 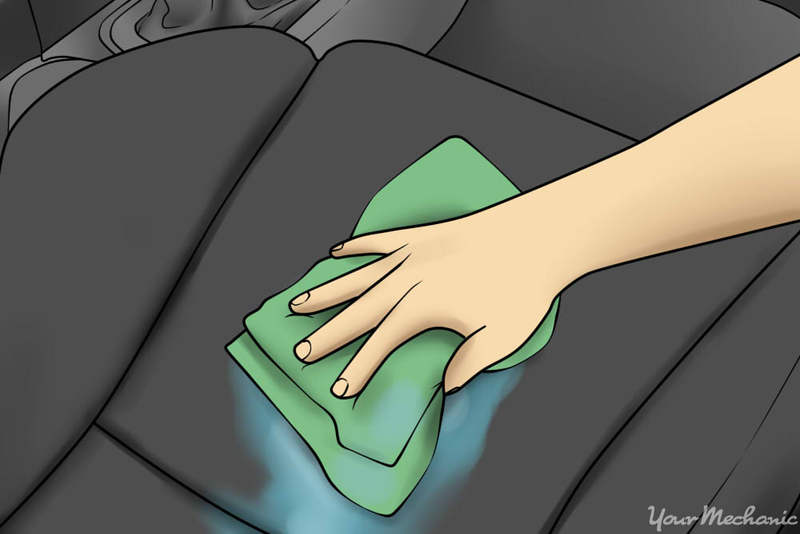 Test the chemical on an area that is not easily visible before trying it on your seat so you know how it will react. Step 6: Apply non-acetone nail polish remover. Use a cotton swab wetted with nail polish remover instead of applying it directly to the leather. Wipe the paint with the end of the cotton swab, being extremely careful not to go beyond the edge of the paint. Step 6: Dab with a clean cloth. Once the paint is moistened with nail polish remover, dab it carefully with a clean cloth or wipe it gently with a dry cotton swab. Be careful not to spread the moistened paint beyond its current area. Repeat as necessary until the paint is completely removed from the leather. Step 8: Wipe the seat clean. 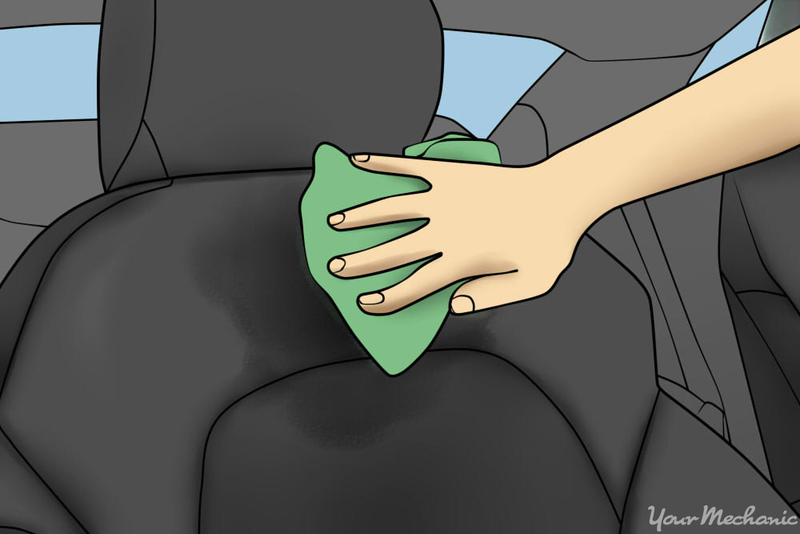 Wipe the seat with a damp cloth, neutralizing the chemical on the seat. Step 1: Treat the leather with conditioner. Nail polish remover or other chemicals can dry the leather or pull some of its dye out, so it’s important to add conditioner to prevent and repair any damaged leather. Wipe leather conditioner all over the seat. Spend extra time wiping the paint spot you just cleaned. This alone may be enough to conceal the stains left by the paint spot. Step 2: Dye the exposed leather. Matching a leather dye is nearly impossible to do on your own. If the spot where the paint used to be is quite visible, find an upholstery repair facility that specializes in leather repair. Have the shop match a dye and touch up the seat as best as possible. Completely concealing the damage may not be possible, though matching the dye will minimize the appearance of the spot. Step 3: Condition the leather regularly. With consistent leather conditioner application every 4-6 weeks, the repaired spot can eventually blend into its surrounding. Getting a paint stain on your leather seat can be very upsetting, but it’s not impossible to return the seats to their original and elegant look. By carefully following the steps above, you can do your best to remove most, if not all, of the paint from your leather. Q: How do I maintain the leather interior? Q: How do I clean the windows and wiper blades? Q: How Do I Clean My Car Mirrors?